Rare’s shared world pirate adventure game Sea of Thieves is merely two days away from launching on Windows 10 PC and Xbox One. To celebrate the event, some of the key developers at Rare joined the Xbox One subreddit community for an AMA (Ask Me Anything) session which yielded plenty of interesting tidbits on the upcoming game. 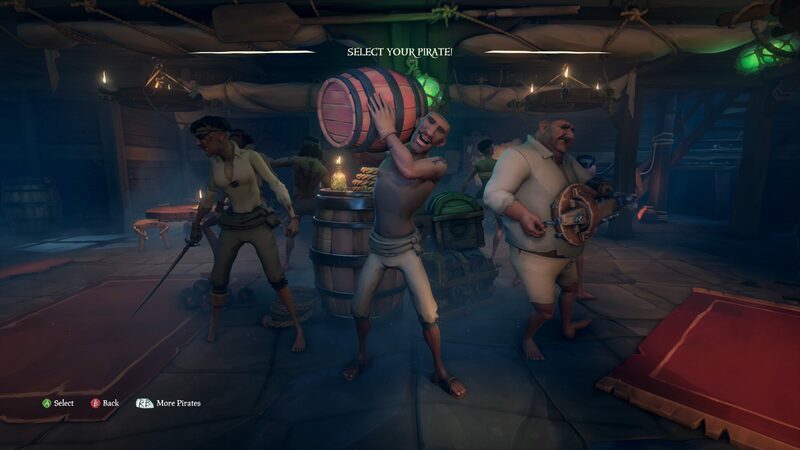 To begin with, it was revealed that Rare is already working on adding the possibility to change your pirate’s hair color as well as unlocking tattoos after specific in-game events. At launch, when you pick your pirate their hair color will remain the same (you’ll be able to change styles in the vanity chest!). We’re currently working on changing color but figuring out how to deliver it. We have the tech working in the IPG (Infinite Pirate Generator) and now we’re working on how to bring that to the vanity chest. Like hair color, we’re working on the design of how we get tattoos to players. We love the idea of unlocking a tattoo after an in-game event. Our IPG tech means we can do this, we think it’s super cool and we’ll look at it post-launch. Then, a fan asked whether it would be possible to add visible anchors and rowboats to the game. Rare replied that the investment for implementing anchors didn’t make sense for them, while rowboats have been prototyped and could definitely become available at some future point. With regards to the post-launch roadmap, Rare clarified that they are going to keep it focused on the next few months rather than laying down the plan for an entire year of content updates. We discussed adding visible anchors early on in the project and honestly made a call that the investment outweighed the aesthetic benefit of having one. We prototyped rowboats, it was super cool. They might make an appearance in future. I think we’re only ever likely to cover a few months ahead to maintain mystery (so you can be surprised and delighted) and so we can be reactive. Things will change as Sea of Thieves evolves. We want to have the time to reveal what the features mean for players before we put them in their hands. We’ve taken a show not tell policy for the entire project so far and we’re committed to that. Sea of Thieves fans interested in seeing more of the fantasy side of the pirate game will be happy to know that what’s available at launch will only be the beginning, with Rare keen to expand these elements. With Sea of Thieves being a fantastical world, we’d like to expand on the fantastical elements of the game. We’re pretty excited about the opportunity this brings. To answer this question a little more specifically, we’d love to expand on both the theme of ghosts and the Ferry specifically. You may have seen that the Pirate Hideout features ghosts of former pirates… in terms of the lore, they are former Pirate Legends that have had every kind of adventure imaginable and through their adventures have amassed many cursed treasures, some of which have allowed them to attain eternal life. The thinking is that if you were a pirate and you’d had every adventure, what better way to spend eternity than in a Tavern built onto a legendary ship. Ghosts fit perfectly into Sea of Thieves and we all love the Ferry death mechanic on the team. Both will no doubt expand over time. Sea of Thieves currently puts you on a sloop or galleon ship depending on your party size, but that might change in the future. Also, Rare is looking at possibly allowing more than four friends having the chance to play together. We’re looking to add the ability to play publicly or privately on any ship you choose after launch. Supporting a four-player crew on the sloop is something we’re looking at. The choice of 4 players was driven by the thinking that larger groups than this would too frequently descend into chaos. Even in real life, 4 people together feels like a good number to share conversation without the group fragmenting into smaller groups. For friends though, this is something we’ll look at and see if we can support. We’re already going to be adding the private ship option some time after launch and this would be an expansion of that. More shanties and the ability to select the one being played are also in the works. We have a plan here to allow you to select a shanty, but also to be able to get more shanties in the world. It’s on the post-launch roadmap but still needs to be prioritized against other features we’d like to do as well. Matter of ‘when’ rather than ‘if’. Finally, Rare confirmed that there’s the intention of allowing players to test upcoming content, which regularly happens with live service games via Public Test Servers. They also commented on Anti-Cheat measures. Joe: In the future we definitely want players to help us test upcoming content. We’re still figuring out this programme. We’re so appreciative of the way Pioneers have helped us so far. It’s been really valuable. Ted: We’ve done a lot of work around our security methods. We’ll continue to monitor as we go. It’s something that’s really important to us. Sea of Thieves can be pre-ordered (and pre-downloaded) via Microsoft Store. Xbox Game Pass subscribers will be able to play it as part of their subscription for as long as it remains active.